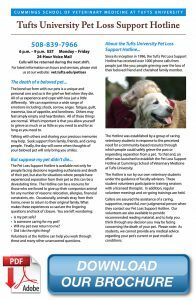 Since its inception in 1996, the Tufts Pet Loss Support Hotline has received over 1000 phone calls from people just like you: people grieving over the loss of their beloved friend and cherished family member. The Hotline was established by a group of caring veterinary students in response to the perceived need for a community-based resource through which people could safely grieve the past or impending separation from a pet. To that end, an effort was launched to establish the Tufts University Pet Loss Support Hotline at Cummings School of Veterinary Medicine. The Hotline is run by our own veterinary students under the guidance of faculty advisors. These student volunteers participate in an all-day training session with a licensed therapist. In addition, regular volunteer meetings and on-going trainings are held. Callers are assured the assistance of a caring, supportive, respectful, non-judgmental person when they contact our Pet Loss Support Hotline. Our volunteers are also available to provide recommended reading material, help you think through any decision you may be facing concerning the death of your pet, and to help you discuss your animal’s death/loss with your children and friends. Please note: As students, we cannot provide any medical advice regarding your pet’s current or past medical conditions.